Hygge is a Danish concept that can’t be translated into one English word. It is more used to describe a feeling of coziness and contentedness in life. Hygge is about living in the moment and spending quality time with loved ones. It’s about creating a peaceful, welcoming environment and cultivating connections. In many ways, hygge is about self-care, and some of its most important benefits to your health is that it can help you to reduce stress, increase your feelings of happiness, and can help you feel more satisfied where you are in your life right now. I’m sharing seven simple ways you can incorporate hygge into your life in an effort to practice self care. A Hygge lifestyle is all about being in the moment. It’s hard to stay in the moment and create personal connections if you are always attached to social media. Turn your phone off, put away any distractions that might distract from you being in the present moment, and enjoy. This may take some getting used to, especially with the fast paced world we are accustomed to. But try it out and see how much more relaxed you are. You family will benefit too! If you want some inspiration on creating a morning routine, you can check out Bailey’s post here. I also have plenty of resources on starting your morning off right by creating a nightly routine. Think of thick socks, sweaters, leggings…anything cozy and comfortable! Hygge means home cooking. Think about your favorite comfort foods and ways you can create those. Think of whole food ingredients and savory spices. Baking is also a tradition in Danish households, so get the kids involved and bake up some breads and muffins and scones. Think about food as an indulgence, instead of just something to put in your body at the proper times. You can still eat healthy, but give yourself permission to make a hearty stew or make a pot of hot chocolate on the stove, served with whipped cream. Take the time to enjoy the process of creating these comfort foods and then savor them. Jasmine has been shown to have a sedating effect, so it can help reduce anxiety and tension. Sandalwood relaxes and soothes the mind, the Jasmine brings clarity. Contrary to popular belief, lavender is not sedating, but balancing. If there is too much energy lavender will help calm, but if you need a small boost, it can be used for increasing energy. This is a very soothing option for you. The refreshing clean fragrance of bergamot has been shown to have a lifting effect, so it can stimulate uplifting thoughts and feelings and improve energy levels. Ylang Ylang is often mentioned as being helpful with stress and anxiety. Use it to set your mood on happiness, gratitude and celebration. Not only do their candles look great, but their flickering flames will also add to the overall ambiance. If you don’t have natural candles available to you, look into creating an ambiance with essential oils. You won’t get the warm, flickering glow, but you can still experience that relaxing, cozy aroma. If you have a fireplace, even better! 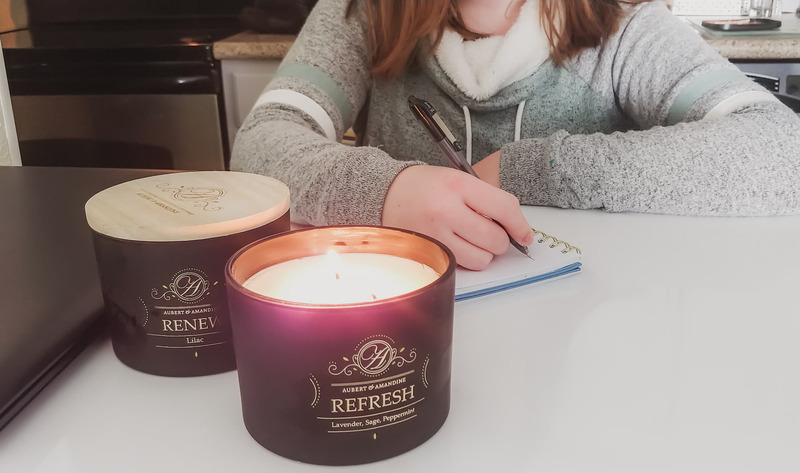 You can even use candles to uplift and put you in the right state of mind when you need to study or just want to cozy up with a book, without falling asleep. Renew your mind and ward off the blues. Let the soothing fragrance of lilacs take you to a place of relaxation. Often described as a symbol of first love and innocence, lilac is also associated with Easter, as it blooms during this time of the year. Sage essential oil helps you feel refreshed while Mint essential oil sharpens your senses, softened by the Jasmine notes. Hygge is vital to a healthy lifestyle, so treat it as a special event—schedule in that casual dinner party with friends, or time to read a book, and just relax. Board games, books, and taking a stroll is also hygge. Embrace your animals, too! All of this lifestyle is pretty much a prescription for relaxation. Create little nooks in your home, where you can snuggle up with a blanket, a good book, a warm drink, and a cat at your feet. Indulge in little treats for yourself and loved ones, like special dark chocolate, a couple high quality candles, or that luxury brand coffee you had your eye on. Hygge is about taking care of yourself and doing the small ordinary things that give you pleasure. While hygge is not just about making sure you have these elements in your space—after all, the main component of hygge is that you’re feeling present and spending quality time with yourself or your loved ones—creating an environment where it feels like you are taking care of yourself in every single aspect of your life is sure to spark contentment and coziness. What aspect of Hygge appeals to you most? Is this a form of self care you could get into? Aubert & Amandine graciously sent me these candles so I could accurately and honestly share them with you. I absolutely love the concept of hygge. I didn’t know something like this existed but I do practise such self-care sessions with the loved ones once in a while. Will be going for a cozy weekend getaway next month for the same. I was just thinking about the smells of spring, and my favorite scent by far is lilac. So excited about the candle you suggested. I can’t wait to check it out. Thanks for the relaxing opportunity! The comfy clothes f hyggeappeals to me the most! I love sweaters, leggings, and boots! They’re all my favorite! This is the best post about incorporating Hygge practices that I have read! You make me inspired to make some changes in our daily life so we can practice this beautiful art of slowing down… something I struggle with! I am a big candle lover and these sound so amazing. Especially the sandalwood and jasmine one. I need that in my life! As a mom with chronic illness, practicing hygge is my life! LOL! Nice post I really relate. I am more into mindfulness practice. And Hygge looks similar.